Panax Ginseng is a monthly column by Henry W. Leung exploring the transgressions of linguistic and geographic borders in Asian American literature, especially those which result in hybrid genres, forms, vernaculars, and visions. The column title suggests the congenital borrowings of the English language, deriving from the Greek panax, meaning “all-heal,” and the Cantonese jansam, meaning “man-root.” The troubling image of one’s roots as a panacea will inform the column’s readings of new texts. For APIA Heritage Month, the SOMArts Gallery in San Francisco ran an exhibit from May 3-25 curated by Jennifer Banta: “The Future Is NOW: Asian America On Its Own Terms.” I parsed the exhibit’s title as a reconception of time (“future,” “now”) through geopolitical space (“Asian America”) and voice (“its own terms”). There were two art installments in the exhibit which I regarded as conceptual centerpieces. The first was “Are we there yet?” by Truong Tran: a small, woven boat suspended over a blue panel with “Are we there yet?” repeated across it in a splash of font sizes. The woven boat here is a ruralized image of the refugee immigrant (i.e. “boat people”) juxtaposed to the refrain of the suburban child in a car’s backseat—two generations of passengers condensed into one locus of space and voice. Across from this piece was another, “Red Lips” by Su-Chen Hung: a pool of water gurgling from a covered and endless source, rippling outward from beneath red tasseled “lips.” In this post, I’d like to show the engagement with “now” to be a convergence of past, present, and future all at once by looking at a literary panel held in the gallery space, and by considering the work of two poets recently featured on the LR blog, Garrett Hongo and Andre Yang. The panel was titled Literasians and took place on May 24th. Kartika Review editor-at-large Christine Lee Zilka moderated a discussion between Sandra Park, Aimee Phan, Lysley Tenorio, and Andre Yang. Though the art fixtures were not commented upon directly, they were very present as the event’s backdrop. The panel’s description, “writers converging on the APIA literary continuum,” was in line with the thematic use of spatialized time, with “continuum” referring at once to a linear series and a dimensional whole. 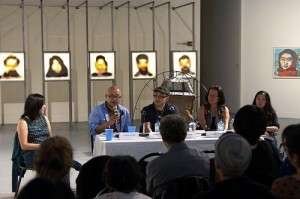 The panelists spoke on one end of the gallery while the water bubbled from “Red Lips” on the other end. Lined up behind the writers was “Most Wanted” by Taraneh Hemami, a series of face portraits elevated and blurred. And even farther back was a timeline chronicling APIA art exhibits shown at this site since 2002. All this contributed to making the space one of historical synchronicity.